The youngsters knew their sport could be dangerous, even deadly. But for the junior team at the Vancouver (Wash.) Rifle and Pistol Club, the peril that emerged from their sport didn’t come from a stray bullet. In 2010, blood tests revealed that 20 youths had been overexposed to the poisonous metal after shooting in the club’s dirty, poorly ventilated range. 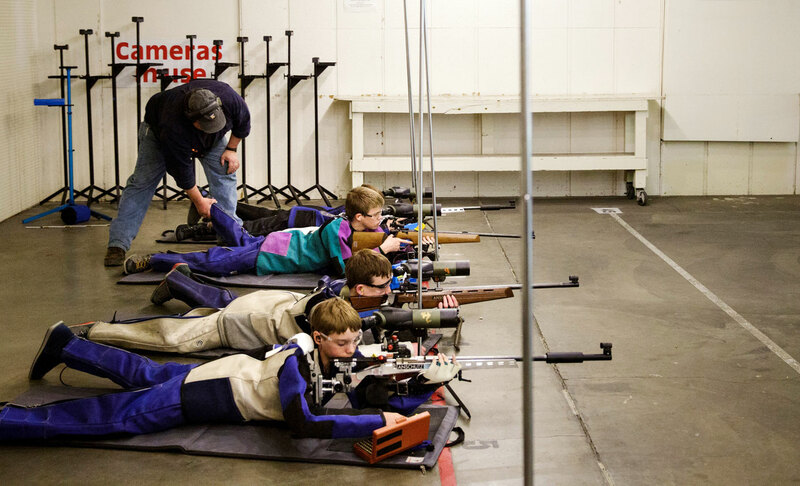 Vancouver Rifle is just one of several private gun clubs across the United States that have posed health hazards in a sport with growing numbers of youths and women. While those most likely to be poisoned by lead in gun ranges are the workers themselves, The Seattle Times has found dozens of avid shooters overexposed in such states as Washington, Massachusetts and Alaska. A Chinese government official in Dapu, Hunan province has suggested that the cause of an outbreak of lead poisoning in over 300 children is the result of “pencil-chewing,” downplaying the possibility a chemical plant in the town could be at fault. Beijing started its crackdown on polluters in April of this year, revising an already existing 1989 anti-pollution law by adding more teeth to the regulations. The revised lawis supposed to take effect the first of the year in 2015, but it seems that many provinces and industrial plants haven’t gotten the message. The official was dismissive of the chemical plant located in the township, as well as the lab reports of airborne dust in the village containing 22 times the legal limit of lead. He also failed to mention the levels of lead, zinc, cadmium and arsenic in the factory’s drainage ditch that runs into the village’s river. Those levels are three times the acceptable level considered safe. According to the official news agency, Xinhua, township chief Su Genlin was dressed down and ridiculed online for his remarks. It seems the Chinese character for the heavy metal is also used for pencil, in much the same way that “lead” has a double-meaning in the English language. Lead hasn’t been used in pencils since the 1500s. It was the porch windows’ fault. Ticiea Fletcher, 43, would pop them open for a breeze as her children played in her south Minneapolis apartment, cleaning her floors regularly to clear settled dust. But everything changed after a checkup in 2009 revealed that her 10-month-old son, Dustin Shields, had high levels of lead in his blood — 21 micrograms per deciliter. Her daughter, 1-year-old Logan Shields, had 18 micrograms. 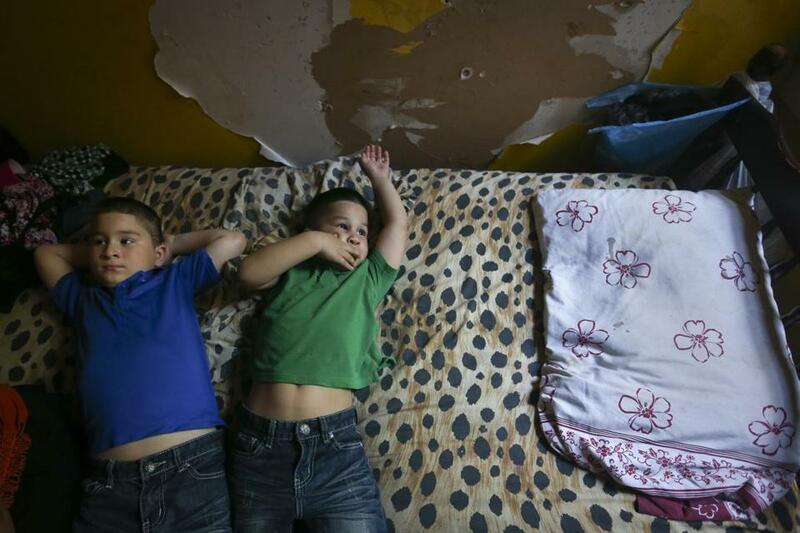 Dustin, now 6, has developmental disabilities blamed on chipping lead paint around windows in the apartment, and Fletcher is on a mission to make sure that other children are spared that diagnosis. 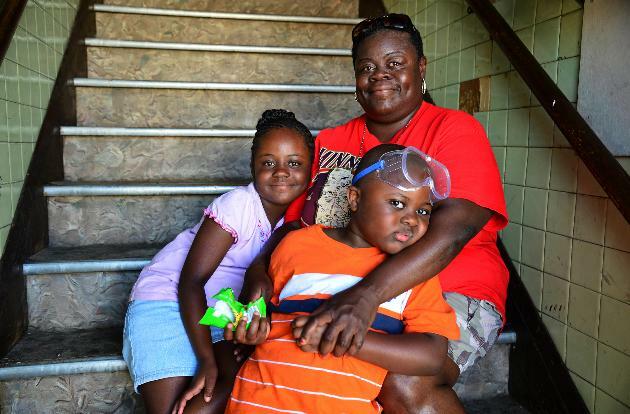 “All the windows were full of lead poisoning and I wasn’t aware of it,” she said. Now, Fletcher is spreading lead awareness through events and word of mouth. To promote her free blood-testing station for children under 6, Fletcher — who has a partnership with healthy-home advocate Sustainable Resources Center — last week was passing out fliers for an event to be held from 2 to 6 p.m. Sunday at McRae Park. And through her organization Missions to the Streets, which works with landlords and tenants to give homes to the homeless, Fletcher ensures her clients can detect lead risks in potential apartments. At that time Dustin’s blood was tested, a level of 10 micrograms per deciliter was considered “elevated” and meant a lead poisoning diagnosis. In April, the Minnesota Commissioner of Health lowered the state’s threshold from 10 micrograms to 5. This means that lead exposure can be limited by removing its traces in homes earlier, said Joe Houseman, director of production for the Sustainable Resources Center, which carries out lead-abatement work. Minnesota has seen a decrease in lead-poisoning cases over the years, but cases still surface, said Stephanie Yendell, principal epidemiologist for the Lead and Healthy Homes program at the Minnesota Department of Health. Houseman said a lower level will lead to more people diagnosed with lead poisoning. Free blood lead screenings are available for people who live, work or attend school near the Exide Technologies plant in Vernon. Los Angeles County health officials made the screenings available Monday after excessive levels of lead were detected in recent emissions from the battery recycling plant. Elevated levels of lead were found in the yards of 39 homes around the plant. 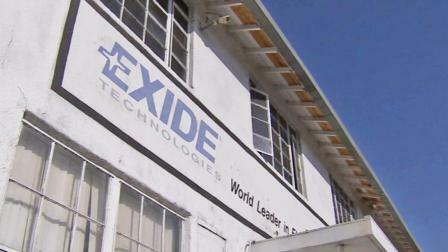 Exide recycles batteries and has been under close scrutiny by state and local regulators over the past year. Residents from Boyle Heights and East Los Angeles have voiced concerns about their safety numerous times. Late-term miscarriages and spontaneous abortions occurred at an unusually high rate among Washington women from 2000 through 2003 — during the same time frame that lead levels were dangerously high in the city’s drinking water, a study has found. 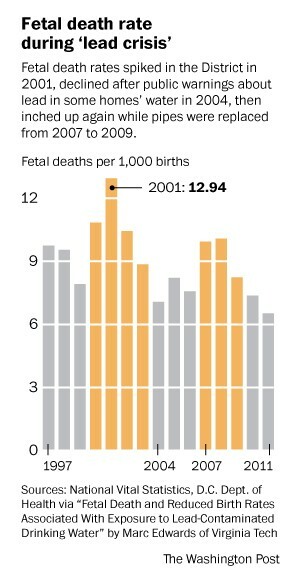 The increase in fetal deaths was an anomalous spike for the District, and the rate of women losing advanced pregnancies returned to average levels in 2004. That is the year that a Washington Post story alerted the public to the widespread lead problem in tap water, and federal health officials began urging children and pregnant women to instead drink filtered or bottled water. The study findings, which are scheduled to be published in the journal Environmental Science and Technology, do not prove that the city’s lead crisis caused fetal deaths or miscarriages. But the results show a significant correlation between the two events. Lead is an extremely toxic metal, and ingestion of lead paint dust and high doses of lead in water have been traced to brain damage, behavioral problems and developmental delays in children. Exposure to lead has also been linked to miscarriages. In the early 1900s, lead-laced pills were used to induce abortions. The study, by Virginia Tech environmental engineer Marc Edwards, contrasts sharply with government-led health studies that were released amid an outcry after people learned of hazardous lead in the water in 2004. Those studies largely rejected the notion that the water had harmed public health. The data seem “to confirm the expectation, based on prior research, that about 20 to 30 extra fetal deaths occurred each year that the lead in water was high,” Edwards said. One rushed and disputed analysis by the Centers for Disease Control and Prevention asserted in April 2004 that there was no indication of health trouble from the water problem, even among children in homes with the highest lead levels in the water. Under repeated criticism, the CDC published a corrected analysis in 2010, acknowledging that this overarching statement had been misleading and based on incomplete data. Dangerous levels of lead are turning up in Chicago homes where pipes made of the toxic metal were disturbed by street work or plumbing repairs, according to a new federal study that suggests the city’s aggressive efforts to modernize its water system could inadvertently pose health risks. The problem starts with lead service lines that Chicago installed across the city until the mid-1980s to connect water mains with homes. Researchers at the U.S. Environmental Protection Agency found that spikes of lead can leach into tap water when those pipes are altered by water main replacements, meter installations or street work. High levels can be found in tap water for years afterward, the EPA study found, raising concerns that other cities with lead pipes could face similar problems. Most homeowners likely are unaware they could be drinking tainted water. Under federal rules, utilities rarely are required to warn residents that work is being done or tell them they can take steps to reduce their exposure to lead. 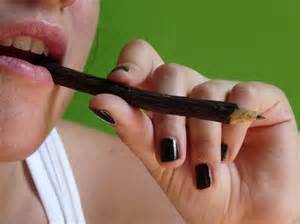 A potent neurotoxin, lead can damage the brains of young children, lower IQ and trigger learning disabilities, aggression and criminal behavior later in life. Lead is so hazardous that the EPA and the Centers for Disease Control and Prevention say there is no safe level of exposure. The metal has been phased out of gasoline, removed from paint and banned in children’s toys. But the widespread use of lead pipes during the last century has left a festering problem nationwide. Childhood lead poisoning is considered the most preventable environmental disease among young children, yet approximately half a million U.S. children have blood lead levels above 5 micrograms per deciliter, the reference level at which Centers for Disease Control and Prevention (CDC), recommends public health actions be initiated. A simple blood test can prevent permanent damage that will last a lifetime. 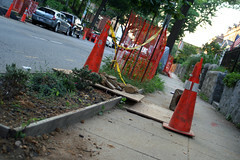 The U.S. Department of Health and Human Services (HHS), CDC, is committed to eliminating this burden to public health. 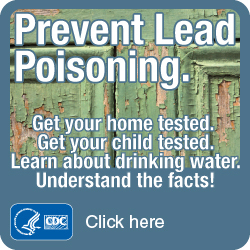 Urge people to take steps to reduce lead exposure. For more information on how you can prevent lead poisoning in your home and community visit the Lead Paint Resources page at Occupational Knowledge International.